I’ve just had a very inspiring and energising two days at a conference and it made me realise how much I had been in a creative rut lately as a writer working from home. Now I’m absolutely buzzing with new ideas and projects I want to do and I can’t wait to get started. Out of these last two days alone I would say that I’ve got weeks and even months of fodder for creating new things and working better more generally. So what happened? Was it just a particularly awesome conference? Well it was great, but what it delivered for me were four factors which I think, when combined, are very powerful inspiration-boosters for anyone regardless of whether or not we have an awesome event to attend. If, like me, you are engaged in creative work and have found yourself in an inspiration rut, try one or two of these to get those juices flowing again. Combine all four if you really need a fire lit under you! 1. Take a break from your normal routine. I booked my spot early to get a discount on the fee and my husband took two days off work so I could attend the whole thing. It was a reasonable commitment for both of us but I needed some professional development and the chance to meet up with like-minded people working in the same area. At the very least I definitely needed a short break from being at home with the children 24/7 because that gig is hard! I arrived early on the first day so I went into a fancy café, ordered a hot chocolate, and read the papers that were put out for customers. I didn’t have to share my drink or the paper with anyone. I could leisurely flip the pages and think about what I was reading. None of the staff interrupted me wanting to know where their shoes were, or if they could use my phone to play Candy Crush. I imagined I was a city worker again, or a high-flyer on my way to the airport. I almost literally felt my brain changing gears, getting into a creative mode. I played with ideas that popped up as I scanned the headlines and noted some articles of interest. 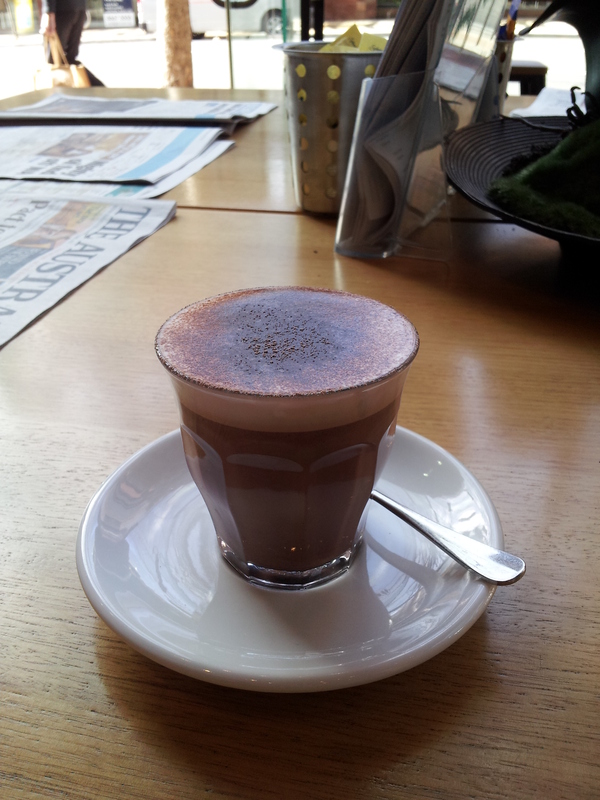 Then I played food blogger and photographed my hot chocolate. I don’t have to go away for days, though, it’s enough just do something as simple as take a different route on my weekend walk and notice the different surroundings, or go to a art show or a talk at my local library. 2. Get input from others who are working towards the same goals as you, but in very different ways and using different mediums from yours. I mainly deal with words on a page or a screen, so I appreciate visual artists and other kinds of artists who communicate similar content in very different ways – in this case through video, podcasts and social media. I also loved the snippets of thought that was shared which come from other great writers here and overseas. Click here to check out this very powerful video we were shown which celebrates Caritas Australia’s 50 years of aid and development work in Cambodia (it’s around seven minutes long). It made me consider using more visuals in my own work, or at least in my writing to do more showing, rather than telling. And I was definitely inspired to start doing more podcasts. 3. Spend some time with the most inspiring person you know. Preferably in person, but over the phone or by Skype is fine as well. 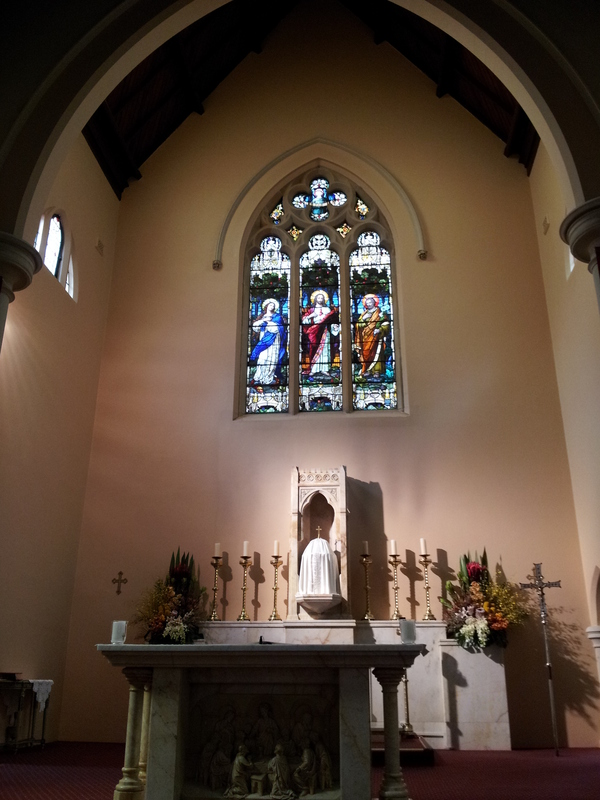 I’m Catholic, which means the chance to catch an early Mass in a nearby chapel on the second day was awesome. Afterwards I stayed before the tabernacle where some of the Eucharistic presence of Jesus is kept. I didn’t say much to him apart from, “Hi, I’m here”, before settling down to listen to what he had to say to me. Be at peace, he said. Remain in me when you go home from here. Tomorrow and the next day and forever after that I will be with you. Be open to the people you’re going to meet today. Something was radiating from the tabernacle behind the altar. Not in any discernible way but I just knew. I let it gently burn through and around me and reluctantly broke the moment when it was time to go. 4. Meet new people. Be interested in and curious about them. Years ago I used to think my husband was a bit cheeky when he’d ask so many personal questions of people he’d just met. Then I noticed that he made friends more easily and quickly than me, who was too shy to ask much. I’ve changed! At this conference I found out as much as I could about every person I spoke to during the afternoon and morning tea breaks and over lunch. I’ve always been interested in people and their stories and I never fail to get inspired when I converse with someone new to me. Every single person has a fascinating story that might inspire you. Find it out, and offer them yours as well. Don’t be pushy, but communicate. 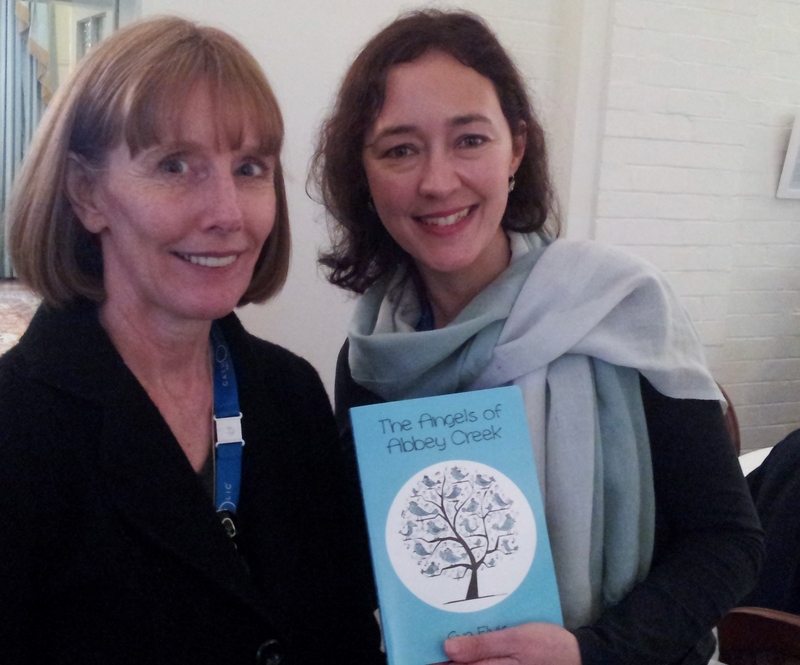 With author and blogger Sue Elvis and her new book, The Angels of Abbey Creek. 5. Take advice. Listen to constructive feedback on your work. I took copious notes and hope to utilise much of what was presented at the conference both here on this blog and in other places. And I took on board the good suggestions that writers, editors, and other communications specialists offered to me. They had surprisingly different perspectives on what I’m already doing and what I could do, which was so valuable. I realised I’d been spending too much time in my own head with my own stale assumptions and ideas. It had been eroding my confidence. Being with others who had a more objective view of what I could do gave me a massive injection of courage to take up my pen (and laptop, and camera, and recorder!) again and use them in different ways. My one big take-away? Creativity needs community. Now I’m all fired up, and I’ll remember next time what to do when I need some motivation again. What about you? What do you do when you’re lacking a bit of zing or are just feeling frustrated that you’re not getting anywhere creatively? Next Post Be a peaceful parent, stop looking for stuff around the house. Oh look, there’s me. And my book too. (Thank you.) You look beautiful! So does the chapel… and your coffee! I just love your post. It sounds like you’ve come home buzzing with ideas. I have too. Are you interested in belonging to a blogging mastermind group? I don’t know if you saw my post on the Southern Cross New Media group page. I’m looking for like minded people to work with! It was so lovely meeting you this week. I hope we can stay in touch. Hi Sue, it was great to meet you too and I hope to see you again because I didn’t think to get you to autograph the book! I hadn’t seen the group page, I’ll have a look.